You can find the basics of square dancing by clicking here. For men, long-sleeve western-style shirts, a string tie, scarf, or kerchief, dress slacks or jeans, and cowboy boots. For women, either a dress or blouse with a wide skirt, petticoats, pettipants, and either dress shoes or cowboy boots. Many couples coordinate their outfits. Some dances are marked as “casual attire,” which means that traditional square dance outfits are not necessary. A square consists of eight dancers paired off into four sets of two. They all face in. Two couples that face each other, one with their backs to the caller are called the head couples. The other two couples are called the sides. Sometimes numbers are used instead of “heads” and “sides.” The head couple with their backs to the caller is number 1. The side couple to their left is number 2. The head couple facing the caller is number 3. The side couple to their left is 4. Image used from this website. Round dancing is essentially ballroom dancing, but instead of having free reign, you follow the steps given to you by a round dancing cuer. Round dancing requires lessons separate from ballroom dancing lessons, as the names of movements differ. 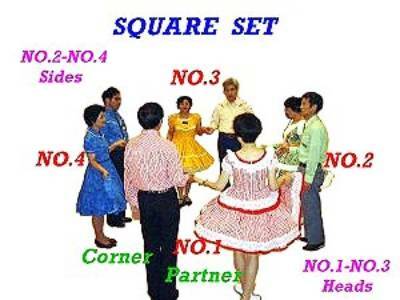 In square dancing, a caller is a trained person who prompts dance patterns and figures during a square dance. They usually do this by incorporating the different square dance moves into a song. A cuer is like a caller, but they specialize in round dancing. Couples move in a circle around a dance floor. Roundlab is the main authority on round dancing and cueing. Mainstream is the first level of square dancing, consisting of 69 calls. Plus is the second level of square dancing and has 31 calls. Advanced is the third level of square dancing and has two internal levels with 46 and 35 calls and concepts, respectively. Challenge is the fourth level of square dancing and has three internal levels with 79, 86, and 83 calls and concepts, respectively. Callerlab is the main authority on square dancing. Their mission is to maintain consistency: dancers who take lessons should expect to learn the same moves so they can travel anywhere in the world and be able to participate in a square dance. From Wikipedia: “Patter calls, also known as hash calls, are based on a quick and fluid succession of spoken (“pattered”) or sing-song delivered calls, often to the accompaniment of an instrumental piece of music that it is not necessarily recognizable as a song. Choreography may appear “on-the-fly” with calls randomly strung together, but it conforms to strict choreographic rules. Most patter calling is improvised by the caller as the dancers are moving; if the tempo of the calling is done at a fast pace allowing the dancers to flow from one move to another without pauses, it may be called hot hash.